NOLA Council passes pro-Palestinian group's "BDS legislation"
The New Orleans City Council meets on Jan. 11. Photo courtesy Jewish Federation of Greater New Orleans. Toward the end of the meeting, six hours later, the council voted on a resolution presented by the New Orleans Palestinian Solidarity Committee that the committee refers to as the first step toward the city divesting from Israel, and afterward proclaimed it as a major win for the Boycott, Divest and Sanction movement to isolate Israel, though in a Jan. 12 statement, the council members disagreed with that interpretation. While the resolution does not mention Israel or the Middle East, the pro-Palestinian group explicitly stated their goals during the 10-minute discussion of the resolution, which passed, 5-0. The resolution, R-18-5, was listed at the end of the published agenda as “under suspension,” but was addressed after a vote to suspend the rules. The resolution notes that New Orleans was declared a “welcoming city” in 2015 “to create a more inclusive, receptive city environment for all local populations” and the city “commits itself to protect, respect, and fulfill the full range of inherent human rights for all, as set forth in the Universal Declaration of Human Rights and numerous other international human rights instruments." 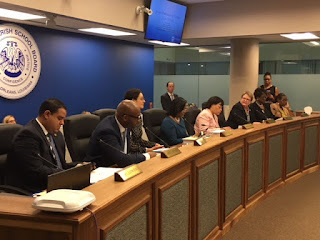 Therefore, the resolution, which is non-binding, said the Council “encourages the creation of a process to review direct investments and contracts for inclusion on, or removal from, the City's list of corporate securities and contractual partners, according to the values of the City as references in this Resolution." While the Federation presentation was the first item on the agenda after the 10 a.m. meeting was underway, supporters of the resolution arrived five hours later for the discussion. At the council meeting, four NOPSC activists spoke in favor of the resolution. Williams called out a list of others in attendance who were interested in the issue; of the roughly 20 names, all were said to be in support. There were no speakers against the resolution. The South-Central Region of the Anti-Defamation League's regional director, Aaron Ahlquist, said the resolution's adoption was "both a deep disappointment and a one-sided, undemocratic process" because of the lack of public notice or opportunity to promote alternative views. While the pro-Palestinian group touted the bill among their supporters as targeting Israel and did not mention any other countries in pushing for the bill, Council members stated they did not intend to single out Israel or any other country. "The Council did not single out any particular companies, countries, nations, issues, conflicts or existing contractors," said Mayor-elect Cantrell. "The Resolution simply seeks to keep City contracts and investments in line with our commitment to upholding universal human rights." "If and when" a group is formed to review investments, "the members will consist of a cross-section of community members and stakeholders, including members of our faith communities," Cantrell added. Council President Williams said "My support of this measure was not, and is not, intended to in any way be reflective of either an anti-Israel or pro-BDS sentiment," and any decisions will be made by a cross-section of New Orleanians. "This resolution is pro womankind and mankind. It is simply humanitarian," he added. Gray said the resolution "was an affirmation of our belief in the basic principles of American Society. No more, no less." Brossett added that the resolution "simply recognizes our support of human rights, labor rights, and New Orleans being an inclusive city." Last January, the group worked with other left-wing groups in New Orleans, under the concept of “intersectionality” or shared struggle, to present a list of demands to the city after President Donald Trump’s immigration order. After a press conference, group members distributed their resolution to the council members. The resolution that passed on Jan. 11 was a shorter version of that resolution. The December protest came just days after Trump declared that the United States would recognize Jerusalem as Israel’s capital, so numerous speakers decried that decision. After the December protest, Cantrell expressed interest in meeting with the group. In leading the discussion, Williams cited the precedent of when New Orleans stood against apartheid in South Africa during the 1980s with a similar resolution. Comparing Israel’s policies to apartheid is a common tactic of anti-Israel groups to delegitimize the country and draw broader support from human rights advocates. Williams moved for adoption of the resolution, with Brossett seconding, and the resolution passed, 5-0. In a statement to Southern Jewish Life, Councilmember Stacy Head said she was not present for the debate and vote, and had put her name on the resolution because "When I saw it early this week, I naively thought it was yet another example of the Council’s historical pattern of putting forward feel-good resolutions, which have no legal effect. The language that was presented to me was merely that we, as a council, want to encourage inclusivity and for our city to be a welcoming place." She took the resolution's language "at face value without understanding its intent," and added that her co-sponsorship "should not be taken as a slight to the Jewish Community in New Orleans, which continues to contribute so much to our city." In a Federation statement issued during the afternoon of Jan. 12, the group said "In a vacuum, the language of resolution’s support for human rights is beyond laudable, but the context surrounding its passage is concerning... supporters of the resolution are promoting the notion that New Orleans is now the first major southern city to pass a resolution in support of boycotting, divesting from, and sanctioning Israel." Louisiana Rep. Conrad Appel tweeted that he was "speechless" at a measure he called "beyond absurd." "Israel is the only democracy in the Middle East and a true friend," Appel said. "So the City Council votes to support those who want to destroy Israel!" In general, Louisiana has not been fertile territory for anti-Israel groups. In May, the Louisiana Legislature took up an anti-BDS bill, which passed the House 75-8 but was then bottled up in the Senate Governmental Affairs Committee. In June, both chambers of the Louisiana Legislature took part in resolutions and floor speeches marking the 50th anniversary of Jerusalem’s reunification by Israel in the Six Day War of 1967. Under former Louisiana Treasurer John Kennedy, who is now a U.S. Senator, the state purchased at least $18 million in Israel Bonds. The New Orleans Federation has organized numerous exchanges with Israel, in the fields of medicine, music and the culinary world. There have been two major collaborations between emergency medical staff and first responders in New Orleans and Israel in the last four years. While the resolution did not specify who would oversee the process to disqualify companies, some have suggested the Human Rights Commission would be a logical venue. Rabbi Edward Paul Cohn, rabbi emeritus of Temple Sinai, is on the commission, as is Caroline Good. Cohn said the resolution was a "surprise attack," a "vicious move" that is "shocking and dismaying." He said the council members "have been duped" and hopes they will move quickly to reconsider the resolution. Bradley Bain, Federation CEO Arnie Fielkow, Ana Ester Gershanik, Jewish Endowment Fund Executive Director Sandy Levy and Federation Board Chair Henry Miller presented the Federation’s story to the Council and received the proclamation. The Federation also brought Dong Phuong Bakery king cakes from Pizza Nola for the councilors and staffers. The Federation’s second statement on the NOPSC resolution says the agency "immediately undertook an aggressive effort to combat a legal instrument which is harmful to the City of New Orleans and also the Jewish community," and is in constant contact with city leaders, coordinating with the Jewish Federations of North America and the national ADL office. Also see: Opinion: Does the New Orleans "BDS vote" have any significance? (Updated 1/12/18 at 1:36 p.m. with reaction from Councilmember Head, updated 4 p.m. throughout). Southern Jewish Life: NOLA Council passes pro-Palestinian group's "BDS legislation"